This year in lieu of a Christmas party, ASP Diliman went carolling. The children's voices were discordant and out of tune at first, but as the practices became more frequent, a balance was achieved. 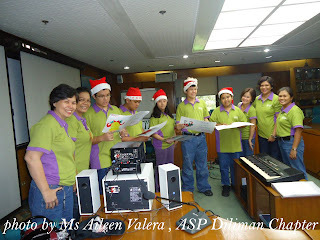 Teacher Greg de Leon from UP College of Music was able to transform and tame our children's voices into angelic ones. It took five sessions of voice lessons before the kids get to finally sing together harmoniously all three Christmas carols: O Come all Ye Faithful, Noel and Silent Night. The first carolling was a whole day affair, starting off with final voice rehearsals in the morning, then lunch at Jo's place and to our first host by four pm. We were so nervous that we made sure we had perfect accompaniment with our keyboard and sound system. Our Christmas shirts and the children's Santa's hats added appeal to our image. Baby and Thanielle Tan painstakingly made our carolers' dainty music sheets. Our nervousness faded after our first stop. We were rewarded with a delicious spread of goodies and tokens. WE were able to spread Christmas cheer to some very welcoming and delighted households. The second carolling day was to a warm reception at the office of the President of the National Power Corp. President Tanpinco took a few minutes off from his busy schedule and was visibly moved by our carollers. And the final carolling day was to a family reunion by one of our member-parent, Dra Marie Segui. 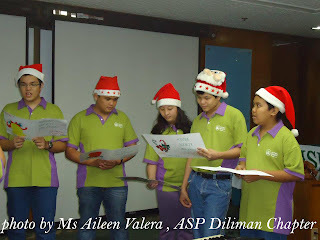 It has been a busy and hectic Christmas break for ASP Diliman carollers- Iking Segui, Bodong Gaban, Rupert Valera, Macky Palomares and Thannielle Tan. "WE and the children were enriched in more ways than one with this experience", say Mom Aileen Valera. "A little tune and voice coming out of Bodong and doing that to a big crowd is truly an accomplishment. Whereas before he only likes to sing alone, now he can tolerate to sing along with other children. He is very sensitive to the sounds and shy to show off his voice in the presence of a crowd. With patience and persistence, I know Bodong will learn to sing and express his own creativity through music in his own time". "For me, it's always the experience that counts. And the bonding and the friendship that is forged along the way", comments Jo Palomares.